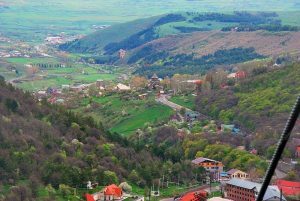 Tsaghkadzor (Canyon of Flowers), a city located in Central Armenia 50 km from the capital, is mostly known as a ski resort, nevertheless, it attracts tourists in all seasons. In the summer, vacationers come here to get away from the city life, to enjoy the clean mountain air and the quiet. And in the winter, the town is completely overtaken by skiers and snowboarders from all over the world. During the recent years, the ski resort was fully modernized and Tsaghkadzor has been flourishing ever since. Today, the city has an abundance of hotels, luxurious sanatoriums, and health spas. New rope way lift has replaced the existing Soviet structure. 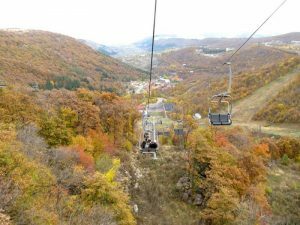 There were initially three consecutive lifts stretching from the foot of the mountain (1,970 m) up to the peak of Mount Teghenis (2,820 m), with the first and second lifts ending at 2,230 m and 2,460 m respectively. In 2006, a fourth lift was added, stretching from the end of the first stage towards an opposite hilltop, thus adding two trails, both leading down to the foot of the slopes. Surrounded by alpine meadows, forests, and mountains, the lift provides an incredible view of the entire area, especially on a clear day, when the distant mountains are visible. Before switching to the next lift, you can enjoy a snack at a small cafe, located by the rope way. Apart from the lifts, the resort offers ski/snowboard rentals and skiing instructors, while a professional rescue team safeguards the territory. Just like most cities or villages in Armenia, Tsaghkadzor has its own monastery. In the past, Kecharis Monastery (XI-XIII) was a major religious center of Armenia and a place of higher education. The monastery has been fully renovated and is clearly visible from the ski slopes.